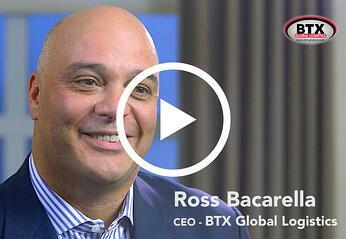 BTX Global Logistics was founded on October 23, 1980 as Baccarella Transportation Express. BTX Global Logistics evolved from a single terminal in Connecticut in 1980 to a global freight-forwarding force with regional offices strategically located across North America. Specializing in the time-sensitive, flexible transportation of shipments of any size or weight by air, land and sea, BTX can take care of all your domestic and international transportation and logistical needs. Rosario “Ross” Bacarella, BTX Chief Executive Officer and President, has propelled the organization to the forefront of the freight-forwarding and logistics industry through his dedication to service, innovation and technology. BTX’s state-of-the-art operational systems allow its service centers to accurately expedite cargo through the most cost-efficient measures without sacrificing service. By customizing and integrating our customers’ needs with the shipping process, we ensure that the highest standards of excellence are met at every juncture of the transportation pipeline. The integrity and dedication of every BTX Station owner, every sales executive, every warehouse or fulfillment operations manager and every BTX staff member is apparent in the exceptional service you receive with every interaction. Delivering a world of service really is our mission.